Yardena Schwartz, a journalist based in Tel Aviv, writes movingly for U.S. News & World Report about the success of Hand in Hand, a network of Jewish-Arab integrated bilingual schools in six locations with 1,320 Jewish and Arab students. The Israeli government provides financial and curriculum support, parents pay tuition, and supporters from around the world contribute. 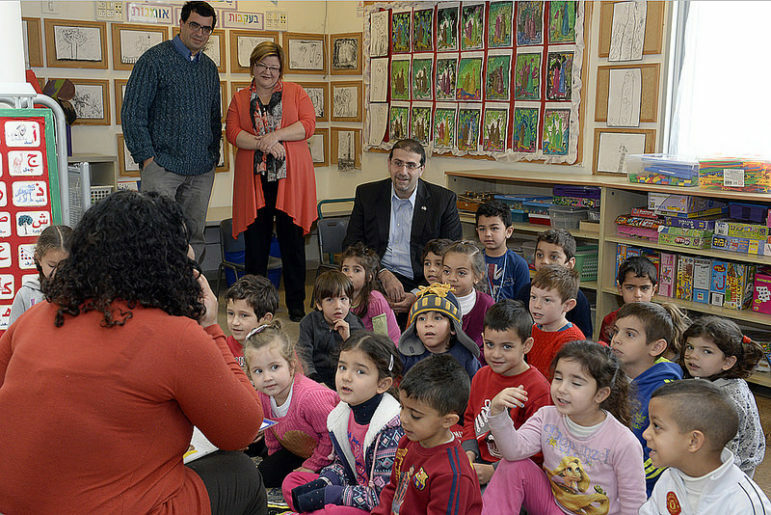 The schools are located in Jerusalem, Galilee, Wadi Ara, Tel Aviv-Jaffa, Haifa, and Tira & Kfar Saba. Each school maintains a long waiting list. New communities are inviting Hand in Hand to replicate its successful model. Hand in Hand is the country’s largest network of integrated education. Its classrooms serve an equal mix of Jewish and Arab students, with lessons taught simultaneously in Hebrew and Arabic by two Arab and Jewish teachers. The school’s curriculum is a mixture of government-directed core topics, such as math and science, and material that Hand in Hand develops. When it comes to the simmering and brutalizing animosity between the Israelis and the Palestinians, Hand in Hand is a fragile miracle. While absolutists on both sides of this conflict deepen their conviction that there is no chance of accommodation, Hand in Hand is “building a shared society in Israel.” While acts of terror and death accumulate, and further cripple the moral and political imagination, these children and their parents do not look away. They look at each other and try to find a path forward together and in peace. Last year, Jewish extremists firebombed two first-grade classrooms in the Hand in Hand school in Jerusalem and painted on the school’s exterior walls this message: “There’s no coexisting with cancer.” Almost all the students returned to school the next day, the classrooms were restored, and thousands of Arabs and Jews marched together to show their support of Hand in Hand and its mission and message. A month later, President Obama praised the resiliency of the school by inviting Hand in Hand students to the White House, where they lit Chanukah candles. “In the weeks that followed, they…could have succumbed to cynicism and anger, but instead they built this menorah. […] Each of its branches is dedicated to one of the values their school was founded on. Values like community, and dignity, and equality and peace,” President Obama said. The resulting publicity made Hand in Hand known throughout Jerusalem, and calls from prospective parents skyrocketed. You have a better chance of summiting the world’s tallest mountain than attending a school in Israel in which Jews and Arabs play together, and you are almost as likely to have gone to space. So when everyone expresses outrage at the hate crime perpetrated against Hand in Hand, it would be good to funnel some of that anger into a wider debate on how everyone takes for granted the total segregation in Israel’s school system. Inbar and Moran and their fellow students teach us an important lesson for this time in our history,” he said. “The light of hope must outlast the fires of hate. That’s what the Hanukkah story teaches us. It’s what our young people can teach us— that one act of faith can make a miracle, that love is stronger than hate, that peace can triumph over conflict.